I may have become just a tad obsessed with my slow cooker. Well, I say mine, I actually stole this crock pot from my Mum and I’m pretty sure she might want it back soon. But hey, I digress, back to the matter at hand: pulled pork. I first attempted pulled pork last year and, my oh my, I fell in love. But slaving away over a hot stove for eight hours was a bit of a chose (especially when I forgot to put it in the oven until 2pm – that was a long night, thank God there was wine!) so cooking the pork in the slow cooker seemed like it would be worth a shot! I bought a nice piece of pork shoulder (with crackling, but you could go for it without, as I had to cut this off before ‘pulling’ the pork and whip it in a nice hot oven to crisp it up. So worth it.) from Sainsbury’s for about £7 and this was perfect to do me and Steve for two meals each. I also thought I would try using some of the Walden’s barbecue sauce we have been trying lately – this is a zero calorie, gluten free, low carb sauce which is gluten free with no nasties at all. It’s big news in the fitness world and I can see why – when you’re on a really strict diet like us (I am trying to lean down and Steve is prepping for a big photoshoot in November) sauces are a bit of a trip hazard, so these have been a life-saver! This stuff is like a miracle if you’re trying to lose weight! The first time I ever made pulled pork I also used brown sugar in the marinade. Although this was AMAZING, Steve and I are avoiding sugar at the moment too (unless it’s an occasional post-workout treat!) so I had to forgo this too. I personally think it adds a really sweet, rich, delicious flavour to the pulledpork, and you could certainly add it to yours – but this is the super healthy, gluten free version! 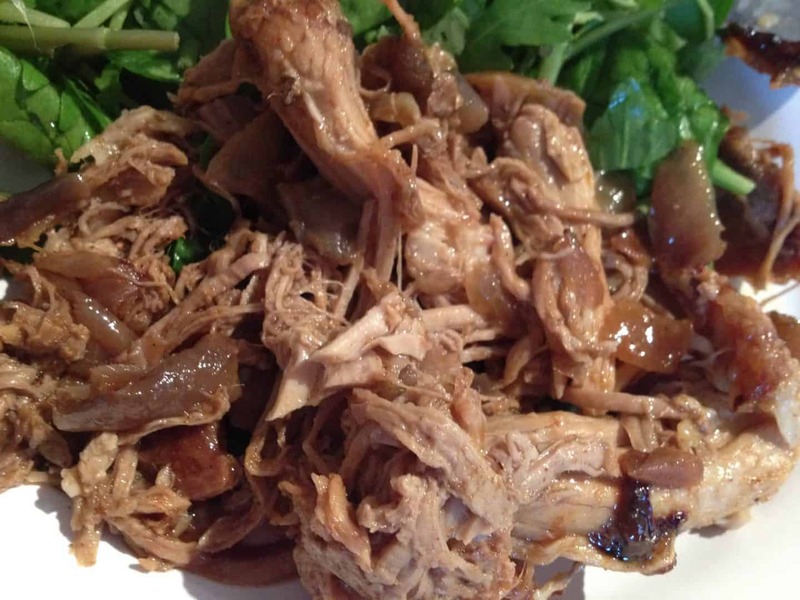 So here it is, gluten free pulled pork in the slow cooker with no added sugar – all you need is a slow cooker – bung it in, enjoy the day and then tuck in for dinner! We had ours with veg but you could go down the traditional route and pile it into a gluten free burger bun with home-made coleslaw…. heaven. Peel and roughly chop the garlic and red onions and add to the slow cooker. Mix the paprika, chilli powder and a generous helping of salt and pepper and rub into the pork shoulder. Add the pork to the slow cooker, pour over the barbecue sauce and water and place the lid on the slow cooker. Cook on a low heat for 6-7 hours. ‘Pull’ the pork into pieces and place back into the slow cooker. Continue to cook on a low heat for another hour. Serve and enjoy!